Junior Shannon Huang hacks the ball with her racket against Alhambra. The girls’ varsity tennis team closed out preseason with its first loss of the year in a tight 8-10 away game against Alhambra High School on Monday, September 18. The team now enters the regular season with an overall record of 5-1. 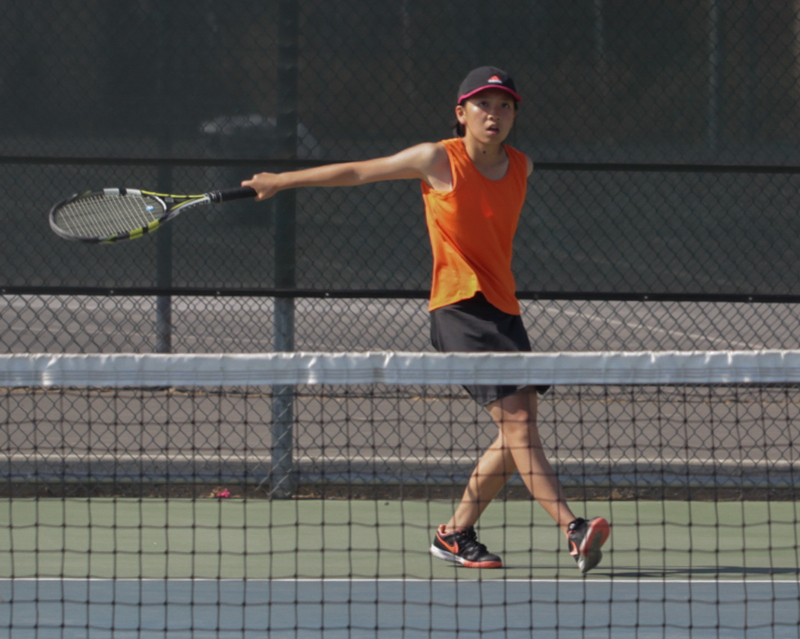 The Tigers faced a strong Alhambra singles squad. Junior Shannon Huang took two matches with scores of 6-0 and 6-2 while freshman Carissa Park pulled past her opponent for a 7-5 win. The team stands against the line, with their rackets laid across the ground. Doubles partners junior Rachel Park and sophomore Teryn Kum swept their matches 6-0 while freshman substitutes Lauren Galles and Skylar Cornforth secured another point for the team. Senior Sofia Tomasevic and freshman Tallula Chow also garnered a win, as did junior Sheila Li and freshman Kimberly Hsueh. Freshman Carissa Park slams the ball in a singles match. Going into the third round of games, South Pas trailed the Moors by a few points. The team was able to catch up to 8-9 with Park left to play the last match. The fiercely fought contest that included a tie breaker game eventually resulted in a loss. The team starts its regular season on Thursday, September 21 at home against San Marino High School. Last year the team lost both games 14-4 to the Titans.